I think it goes away if you do "Rebuild all files", but that's not confirmed. Sadly, it does not. I even renamed the compiled folder and rebuilt all, but I still get that message box. Ok, I got it. Workaround is: go to General Settings, Backwards compatibility, open "Script API version" drop-down list and just close it (leave value unchanged), then compile again. There is a value that does not initialize correctly until this setting is set to something. Workaround is: go to General Settings, Backwards compatibility, open "Script API version" drop-down list and just close it (leave value unchanged), then compile again. Hey Crimson Wizard. The PDB files you told... I am trying to debug one of those 0xC0000005 exceptions: in a specific computer, running Windows 7, selecting the OpenGL driver gets an exception, program pointer +5, but it works for Direct3D - https://i.imgur.com/BBN6mxs.png . I used the beta that was available on 29 November ( https://www.dropbox.com/s/enevvalninme7cn/ags-editor-3.4.1--pre-rc3.zip?dl=0 ). Please release those with RC3. My game Dungeon Hands was executed by more than 40 people, and it worked without errors on Windows 10 - at least no one reported. I found another small issue with the management of dual scaling for Windowed/fullscreen mode. Run the game : it works as expected, i.e. fullscreen, stretched with good ratio. Then launch the game again : it runs in a window, but with stretch-precerbing-ratio mode instead of max round multiplier. 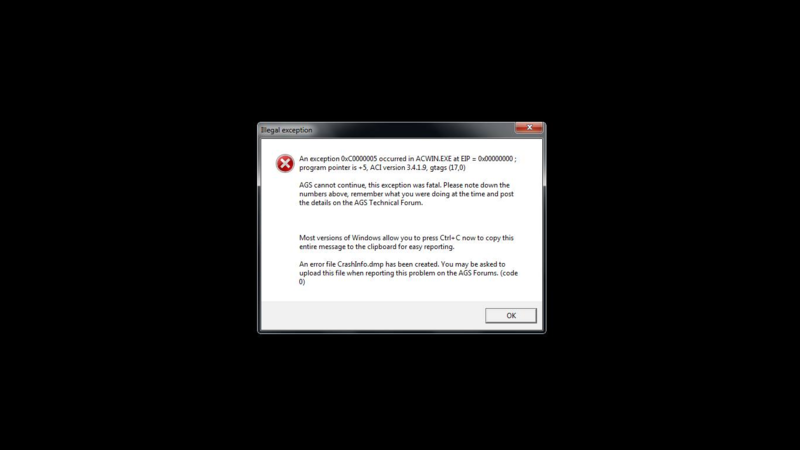 The .cfg in"saved games" only store "windowed=" and not the scaling mode... could it be the source of the issue? No, these scaling modes can be read from default config too. All these issues are because the system was not originally designed to switch at runtime. So now it saves only one variable when exits game (windowed or fullscreen mode) but does not save actual window size. It seems that fixed multipliers in windowed mode do not work. The old code that I was fixing is back, I did mistake when merging changes to repository. The scaling when starting the game in windowed mode is fixed ! But not when you first start the game in fullscreen mode : when you then switch to windowed mode, it uses max multiplier... and not the one you set in the winsetup. Well, that's because I did not code the main functionality, that was first reason of this change. I don't know how this happened, probably I do not understand what I am doing anymore. I am not comfortable without adding it either. You made it... It works fine! Few last-minute changes had to be made to improve usability of this release. - Fixed TRS files could not be compiled if Compiled/Data folder is not present. - Fixed some incorrectly written values in default config. - Fixed script API options were not properly initialized when upgrading old games, which caused warnings appear on game launch. - Now supports separate scaling options for fullscreen and windowed modes. * Linux build pack (https://github.com/adventuregamestudio/ags/releases/download/v.3.4.1.10/AGS.3.4.1.10.Editor.Linux.Pack.zip). I just want to say that I love the new Default Setup page and with the last RC it also works correctly! Superlative work Crimson Wizard, thank you very much! Hey fantastic work Crimson! I've been trying out the RC2 (and now RC3) release after using 3.2 for for the past 3 years and the improvements are so good! I love how smooth alt-tab and alt-enter is now and the updated winsetup is perfect.